I could have show this under H - for but saved it for this week. This commemorated the 50th Anniversary of the University of Iceland. Björn M. Ólsen was the first rector in 1911. 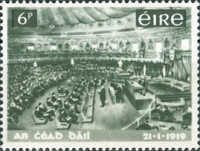 Another 50th anniversary occurred on 21 January 1969 - for the Irish Parliament. Karl Oscar Isakson was a Swedish painter who spent much of his professional life in Denmark where he is considered to be one of the fathers of Modernism. For other 'I' related stamps please visit Sunday-stamps-i. 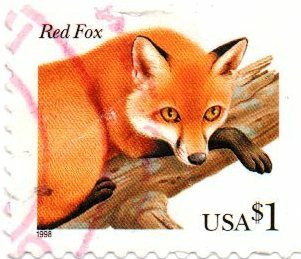 I hesitate to enter into American politics but do so with a stamp from Ecuador. 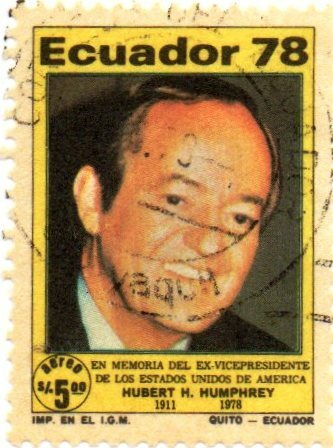 This stamp was issue to commemorate Hubert Humphrey on 28 November 1978. Humphrey had been the 38th Vice President of the USA from 1965-69 under Lyndon B Johnson. He stood as Democratic presidential candidate in 1968, narrowly losing to Nixon by only 510,000 votes. 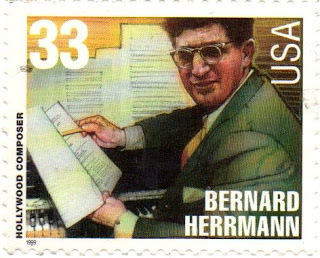 Herrmann (1911-1975) was one of the composers in the American Music Series. I wonder whether Humphrey saw these films and heard Herrmann's music. For other H related stamps cross over to Sunday-stamps-h. 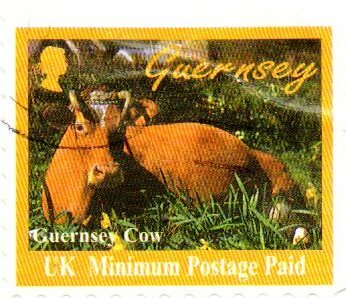 The Guernsey cow was first recorded as a separate breed around 1700. Import of foreign cattle to the island was banned in 1789. The English Guernsey Cattle Society was established in 1884 to provide a record of the ancestry of imported Guernsey cattle. 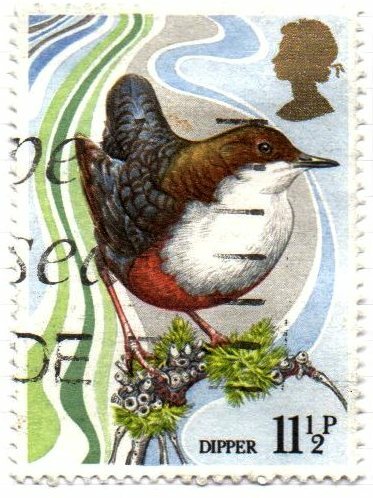 I have been unable to find out when this minimum postage paid stamp was first issued. 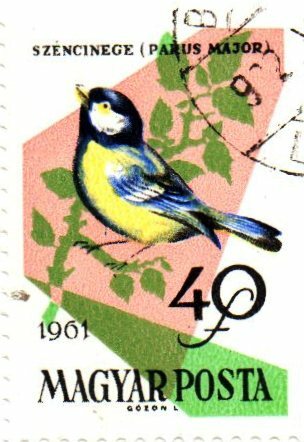 When it comes to garden birds this is one, on a Hungarian, stamp that frequents our garden throughout the year - although it colours are not as vibrant as this. 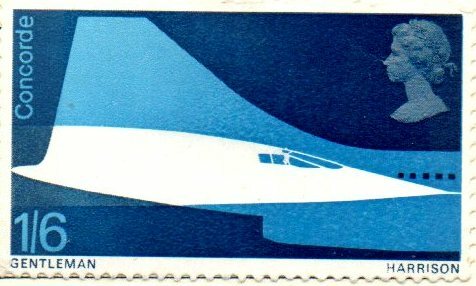 You can examine other 'G' related stamps by following the links at Seeitonapostcard.-g. I went to University in Scotland in the 1950s; St Andrews is located on the coast of Fife. I don't remember ever seeing an architectural style like this. Harling is a rough cast wall finish consisting of lime and aggregate notable for its very rough texture. 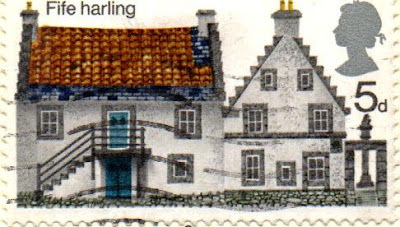 Many Scottish castles are finished with harling which protects against a wet climate and eliminates the need for paint. 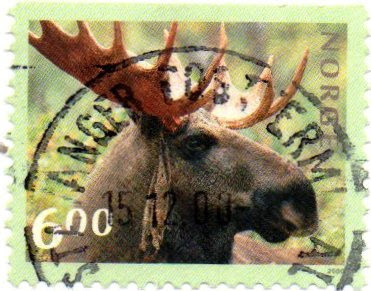 For other 'F' related stamps please visit the links at Sunday-stamps-f.
On a trip in the Norwegian mountains I once saw the rear end of one of these as it disappeared in the woods. It was back in the early 1980s when I worked in Stavanger that I saw 'my' Elk. Staying in Scandinavia I found a Swedish/American inventor whose steam locomotive, The Novelty, was beaten in a Lancashire railway competition in 1829. The winner was George Stevenson's Rocket. 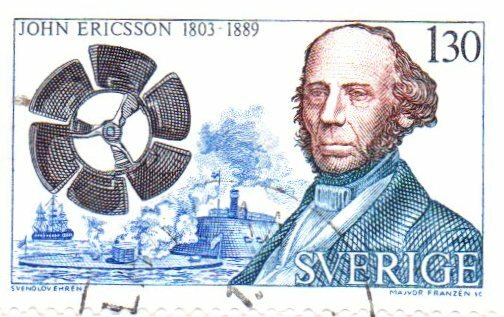 John Ericsson (1803-1889) invented the screw propeller for ships. The British Admiralty were uninterested in this, but it was widely adopted by the US Navy. For a wider look at 'E' related stamps follow the links at Sunday-stamps-e. 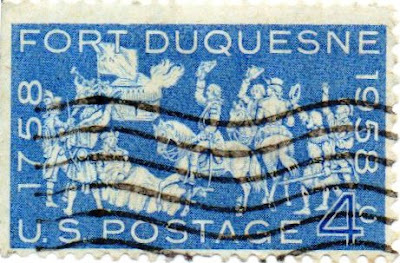 The 200th anniversary of the British assault on Fort Duquesne, held by the French, was commemorated in 1958. The British were led by Brigadier General John Forbes. Among his troops was a contingent of Virginians under the command of Colonel George Washington who later became one of the founders of the USA, and President of course. The French abandoned the fort which was subsequently rebuilt as Fort Pitt (named after the British Prime Minister at the time.) Now it is the location of the city of Pittsburgh. PA.
With pride and without prejudice my second 'D' is a character from Jane Austen. 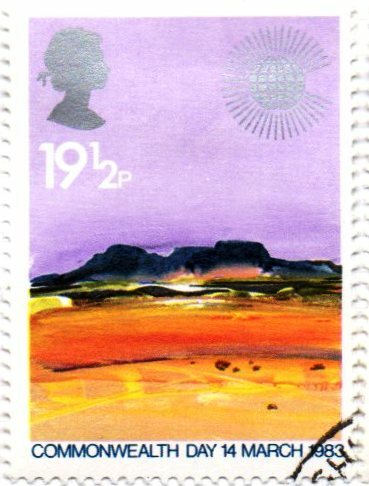 This was from a set of 4 (issued on 9 March) depicting Geographical Regions. I have been unable to find the location of the desert on the stamp. 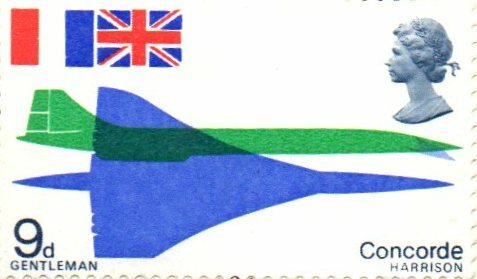 That year all but 15 of the countries in the Commonwealth issued stamps for Commonwealth Day. It would have been much happier in that lake where Mr Darcy got his shirt so wet. You can dip into other 'D' related posts at Sunday-stamps-d. 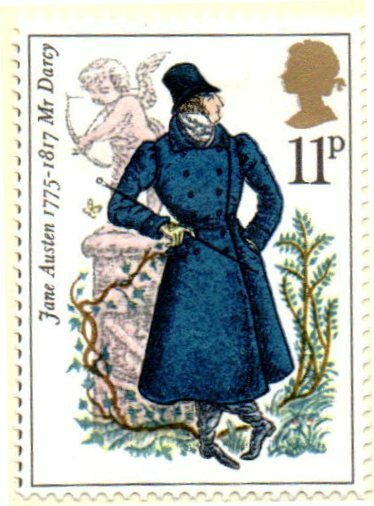 This set consisted of three beautifully designed stamps. a true tribute to this magnificent plane. Concorde's first commercial flight was on 26 January 1976. London to New York was first flown on 22 November 1977. It had the fastest Atlantic crossing of 2 hrs 52 mins 59 seconds on 7 February 1996. The last NY to London crossing was on 24 October 2003. That's Neptune and a Mermaid on either side of the globe. 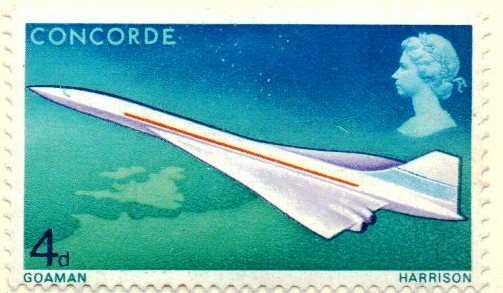 I guess that the cable had handled more traffic before Concorde even flew.